What would cause an Evolutionist to become a Creationist? Dr. Reagan: Mike, your ministry has a rather unusual name — The Creation Training Initiative (CTI). Explain that to us. 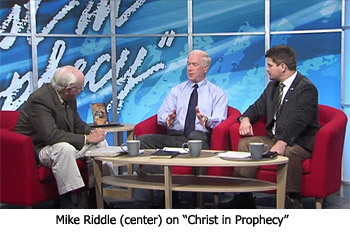 Mike Riddle: There are other ministries out there that teach about the Creation. There are great ministries like the Institute for Creation Research, Answers in Genesis, and a lot of local organizations around the country. What we've done instead is started this ministry to take the next step and actually train others to do what we are doing. It is called replicating ourselves, or biblical discipleship. We give seminars and weekend seminars, but what we do is primarily training courses. We have full-day training courses. We at CTI are tired of seeing over 70% of our youth, our teens, leaving the Church before they finish school. That's an epidemic we have in this country in Christianity. These are students who have been in Christian schools, even in Sunday school for 12 years, but then leave. Why is that happening? Well, they no longer have confidence in the Bible anymore. They don't see answers in the Bible. That is why we started these full day training courses, so the youth of today would have the answers from the Bible that they are looking for. When you come and take a course such as "Basic Creation Training," you would get a 100 page manual. We feed you lunch and we feed you snacks. These courses are also certified for continuing education units. We will come to you. It doesn't cost the church anything to have these courses as we charge per individual because we are trying to get this information out. We even have a course specific for teachers where we train them on what the Bible has to say about teachers and how to teach. We even have a third course called "Advance Creation Apologetics" where we train you to take the next step in evangelism. You'll learn how to talk to a Ph.D. scientist and not have to know anything about Science and bring down their humanistic strong-holds. Dr. Reagan: I compliment you on that mission as it's very important. Something that we've always had a heart for at Lamb & Lion Ministries is to replicate. We've done it primarily by helping others establish ministries that focus on Bible prophecy. We've helped create five of those ministries so far domestically and then helped train them to communicate the Message. So, God bless you in what you are trying to do! Dr. Reagan: Mike, tell us a little about your background. What sort of background do you have that gives you some authority in the area of teaching Creation Science. Mike Riddle: One of the things that helps me, unfortunately, is that I was a slow learner. I admit — I grew up an Evolutionist. I wasn't even a Christian until I was 30 years old. So, I understand Evolution and its arguments very well. I could use them in churches and it was very easy to take a church off track because they are not well trained in refuting Evolutionary teachings. So, I've got the common man's background in following Evolution. I also have academic credentials with degrees in both Mathematics and Education. Do you know my most important aspect I have as my credentials? I'm a Bible believing Christian now. I accept God's Word as my authority. That's my number one credential. I have the Math. I have degrees in Education. I've got a vast experience in computer technology. That's where I get all my logical thinking from — the Math and Computer Science. Dr. Reagan: How did you get started teaching about the Creation? Mike Riddle: It's in response to having grown up as an Evolutionist. I was also, well, I'll put it this way — I used to be an athlete. If everyone understands what that means, I used to be an athlete. That's the law of science called Thermodynamics that tends to take you downhill a little bit. Mike Riddle: Yes, entropy happens to all of us. Dr. Reagan: I realize that when I look in the mirror every morning! Mike Riddle: One day I was in the gymnasium lifting weights and I had a man come up and sit down beside me. This man started sharing with me the Gospel. He asked me some questions. But, at that time, I had no interest in God, so I ignored everything he had to tell me. Seven years after that I was in a hotel room on a business trip having to do with computers at the time. That's when I finally understood that man's message and that's the night in that hotel room when I got on my knees and professed Jesus Christ as my Lord and Savior. Before I went to sleep that very night I had a strong desire to teach the book of Genesis, which I hadn't even read yet. So, I reached into the drawer in that hotel room and pulled out the Bible and began reading the book of Genesis. I thought to myself, "Wait a minute, this is not what I was taught at the university!" I learned that if I cannot trust the first chapter of the Bible, then there's no reason to read the rest of it. Clearly then some of what I was taught at the university was just not true. I had the opportunity since to travel all over the country and I'd stop and talk to these college professor and scientists. I soon found a pattern to their answers about Evolution. They had a lot of wonderful stories, but not one of them could directly answer my questions. So, I thought, here are these people who are very, very intelligent, but they couldn't answer my most basic questions about the origins of the universe and mankind. So, why should I then believe in Evolution? That's when I turned to the Bible and I found those answers. In the second segment of this Creation training series with Mike Riddle, we'll ponder the true age of Earth. I have always been taught that God created Earth in 6 days. I have heard tv programs that state it took millions of years for earth to be created because a day to God is millions of time for us. When friends said that, I couldn't come back with a good answer. But one day, all of a sudden I saw something in Genesis I had just missed for all these years. The first think he created was night and day..
Then after every creation he makes the same statement. ..And God called the firmament Heaven. And the evening and the morning were the second day. I find it interesting that so many Christians who believe in Jesus, the miracles He did, the story of the Exodus and the flood, etc. have no problem with all those truths yet suddenly can't accept that a God that did all those things couldn't make creation in 6 days. The bible starting in Genesis 1 actually explains that the world became chaos. It's called the Katabole. That is why we have the fossils of dinosaurs. The first earth age was destroyed. 2 Peter 3:5-7. We are in the 2nd earth age. Science is correct. Verse 6 states the world perished. Verse 7 the heavens and earth that are now, is the new earth till his return. You said, "...what many scientists are not looking at is the overwhelming amount of scientific evidence that shows the earth is very young." Nothing could be further from the truth. The only overwhelming thing is the way that young earthers violate the Scientific and Religious Value Systems in misinterpreting and misusing existing data;using ad hoc arguments when they cannot explain something; and twisting good, scientific and religious studies. You ought to be ashamed of yourselves. Chuck, it is your opinion only that Young Earth supporters misuse existing data, with nothing to substantiate what you are claiming. The evidence for a young earth is all around. I was raised in a church, but didn't know Jesus and told my mother that when I reach 18, I would never enter a church door again, but after salvation God showed me He called me before I was even born, oh that broke my heart and I started looking for someone to disciple me, but found no one, so I asked God to disciple me and He did by the Holy Spirit and emphasized the real Truth of the Scriptures as I read. I was 47 when I found Him after a plane crash in the Sierra Madres in Mexico in 4/1983, now He is my whole life and I am His witness to as many as He opens the doors to!!! Awesome testimony, James! Thank you for sharing it as an encouragement to others. The "six-day" creation is troublesome for me. If in fact days one through six are said to be 24 hours long 1) how is time reckoned when their are no people to do so, and 2) how is a day determined if there is no sun by which to determine it, and if the six days are indeed of 24 hours, then 3) how long is the seventh day, and 4) if the seventh day is longer than "24 Hours" why is that and how long is it? Anonymous, 2 Peter 3:5-7 is talking about Noah's Flood, not some non-Scriptural Antediluvian Flood. GaryG, where are you getting the seventh day is longer than 24 hours? Genesis 1:1-2, let us know about the earth being without form, and void; and darkness was upon the face of the deep. And the spirit of God moved upon the face of the waters. (no time period stated here). I don't understand how anyone can read further into the rest of this chapter and think it took more than six days. He called the light Day and the darkness Night. Our God (our Father) is all knowing. Jesus died on the cross and was raised from the dead (it was days) not eons, this day thou shall be with me in paradise, said Jesus . Sometimes I think we just think too much. Holy Spirit, thank you. Nathan wrote, "Chuck, it is your opinion only that Young Earth supporters misuse existing data, with nothing to substantiate what you are claiming." Nathan, you obviously are a young man who has a fair amount of bible knowledge, but not much scientific training. "My opinon only... nothing to substantiate?" Come on. Nathan, do you honestly believe that all the scientists (Christians and non-christians alike) in the world are wrong on every aspect of physics, biology, geology, chemistry, etc. and that your handful of "experts" are right on every aspect? You would have to believe that in order to buy into the young earther paradigm. Just to let you know, I believe that God created the earth in six days. I believe that He used His own mechanism--it may have been the big bang; I do not believe in evolution. I believe in an old earth as evidenced by both Biblical (Isaiah 14; Ezekiel 28; Jeremiah) and scientific research. I believe in a religious and scientific value system that tests all theories--and through which, young earth stuff fails. I believe in a gap between Genesis 1:1 and 1:2; I believe that the ancient Hebrew supports "the earth became" as opposed to "the earth was." I also believe as Glenn Morton and other ex-young earthers do that the attacks by young earthers on good, Christian people, who happen to disagree with their beliefs has harmed Christ's Church more than all the damage inflicted by non-christians. Attacks from within (Acts 20). Chuck, rather an arrogant and condescending post on your part. I was a space science major before being called into ministry, so know a thing or two. Even if I'm not a scientist, I have scientist friends who are experts in their fields. They tell me two things: 1) scientists are pressured to conform to the Old Earth and Evolutionary model thinking or be ostracized professionally so they rarely buck the system, and 2) Science only proves again and again and again that the Earth is young. You must obviously be an old man if 40 year olds are young to you. Stick with the Bible. It's God's first-person account and authoritative word. Anything else is man's attempt at trying to understand a world far bigger than they are capable of. Nathan--that was kind of a lame response for a person who writes a column; but you will learn. I apologize for calling you young; I'm sorry, you don't seem 40 and I am an old man. I fed you a few points to refute, but you didn't bite.I hope you don't just routinely resort to the old "I have more scientific friends who support me, than you do", argument or call me names. That would put you down with the majority of the young earthers who, to their shame, write off the scientific community. When I am reading young earth stuff, I sometimes have to wonder, what happened to "go into all the world"? Have a nice day. I will pray for your enlightenment. Thanks, Chuck, you made my point! Kenjyn--you really are on to something. Please delve further into the old Hebrew of Genesis 1:2 and compare with Jeremiah 4:23. The majority of Bibles misinterpret that Scripture (Genesis 1:2) as "the earth was without form and void"; when a much better interpretation is "the earth became without form and void". Compare it with Jeremiah 4:23, which explains the condition of the earth and heavens "without form and void and the heavens had no light." Then see Jeremiah 4:24-27, which explains that there were cities, mankind, birds, and a fruitful land that had become a desert. But, note that God did not make a full end (v. 27). This explains the condition of the earth in Genesis 1:2--God simply recreated an existing earth. Looking at it in this manner, puts an entirely different slant on the whole process. Chuck and Kenjyn you both are wrong. First the phrase "In the beginning God created the heaven and the earth" is a independent clause. And there is no reason to change the earth was, to the earth became. The King James by the way is the correct translation to this phrase. Read Exodus 20:11 this further proves you wrong. The earth is young and any science that says other wise is wrong. With old earth science you allow science to interpret the Bible. The Bible has to interpret science. If science doesn't line up to the Bible then it is wrong. You can't have death and destruction before Adam. That makes no biblical sense that God simply recreated an existing earth. Indeed you were, Barry. I'd told Chuck earlier that he was welcome to post a link to his info, but not all his pages of notes in our comments section. The only response he seems capable of making is snide and condescending, so I'm deleting him going forward.